No need to live above a bakery to enjoy the warm aroma of freshly baked bread on a daily basis. Equipped with an array of user-friendly features, this automatic bread machine by Panasonic makes baking fresh, healthy homemade bread–and much more–easier than ever. Now anyone can enjoy the simple pleasure of freshly baked homemade bread–without the time-consuming efforts normally associated with kneading and baking bread. Just add ingredients, press a few buttons, and it takes care of the rest. Choose from 2 loaf sizes and light or dark crust colors. The bread maker mixes, kneads, rises, and bakes bread in two loaf sizes–medium and extra large, plus offers crust color control with light and dark options to accommodate individual preferences. Its digital control panel with a large easy-to-read LCD display makes it simple to select the loaf size and crust shade, as well as the baking mode. Choose from five different modes: Basic, French, Pasta, Pizza Dough, and Bake Only. The Basic mode works well for a variety of breads, including white and whole wheat; French mode bakes up delicious French bread with a soft interior and crispy exterior–perfect for pasta night. Speaking of, Pasta mode makes several different types of homemade pasta dough–there’s nothing quite like homemade pasta. Use the Pizza Dough mode for creating homemade pizza dough in just 45 minutes, or use the Bake Only mode when it’s time to bake a cake for a birthday celebration or delectable tea breads to serve with tea when visiting with a friend. Various modes for baking bread or creating dough. Even more, the bread maker allows for baking a variety of white or whole-wheat bread for slicing and slathering with butter and jam or for making healthy sandwiches to put in the kids’ lunches during the week. Or, make bread dough for shaping by hand and baking in the oven. The versatile machine produces delicious results without the additives and preservatives found in store-bought brands. Best of all, the bread maker comes with a programmable timer that can be set up to 13 hours in advance, which means it’s possible to wake up in the morning to the smell of freshly baked cinnamon-raisin bread. Or set the timer before leaving for work in the morning so that a warm loaf of rosemary bread will be ready and waiting after a long day at the office. Simply slice it up and serve with dinner. 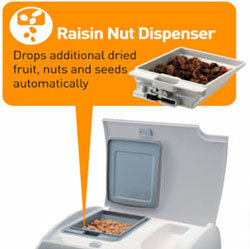 Automatic raisin dispenser removes for easy cleaning. The bread machine also provides a unique dispenser that automatically drops up to 5.29 ounces (150 grams) of raisins, dried fruits, or nuts into the bread dough at just the right time for thorough, even distribution. When compared to other bread machines, the SD-RD250 turns out loaves with an even scattering of raisins, instead of a clump in one section and bare sections elsewhere. The handy dispenser can also be removed from the machine for convenient washing between uses. 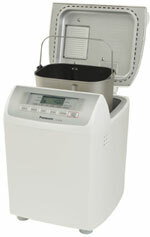 Unlike other bread machines, the unit does not offer a viewing window. The absence of a viewing window creates a more even reflection of heat inside the unit, which offers the following three advantages: excellent crust, good rising, and even color. Removable nonstick pan with carrying handle. View larger. Baking bread at home allows for ultimate control over the finished product. By using only the freshest ingredients and making choices from a variety of options, homemade bread can be an important part of a well-balanced diet–for both young and older family members alike. High in fiber and low in fat, bread contains a wealth of beneficial components. It provides complex carbohydrates needed for energy, protein for strong muscles, and vitamins and minerals, including calcium and iron for healthy bones and teeth. Add nutrient-rich eggs to the recipe or choose whole-grain flour for an extra boost of fiber, iron, vitamins, and minerals. Mixing in nuts and dried fruits not only add to the pleasing consistency and taste of the finished product, but they’re also another way to add to the overall health factor. Diamond-fluorine coating on scratch-resistant baking pan for enhanced durability. The bread maker provides an inner bread pan with a generous loop handle for easy removal (use an oven mitt when hot). The rugged pan also features a diamond-fluorine coating for even heating and scratch-resistant, long-lasting use. In fact, the hard diamond particles, which cover both the surface of the kneading blade and the bread pan, are twice as hard as fluorine resin for unbeatable performance. For added convenience, the pan’s nonstick interior ensures effortless food release–dough removes without sticking to the pan and fully cooked cakes and loaves of bread slide out smoothly from the pan and onto a cutting board for slicing and serving. The pan’s nonstick coating also makes cleanup a snap. The small appliance comes in a slim, compact design that takes up minimal space on the kitchen countertop. Keep it out for everyday use or store it on a shelf or in the pantry when finished. Awarded the Good Housekeeping Seal of Approval, the 550-watt automatic bread maker measures 14.6 by 11.1 by 12.8 inches and carries a one-year limited warranty. Accessories include a measuring cup, measuring spoon, and recipe booklet with great tasting ideas for getting started.